Michael Moore is well-known for his liberal agenda; at least that’s how we label him, both liberals & conservatives alike, as a leftist filmmaker who lobbies for gun control & free health care through the silver screen. As a documentarian, he’s known for statement films, movies with motive, not investigatory journalism. 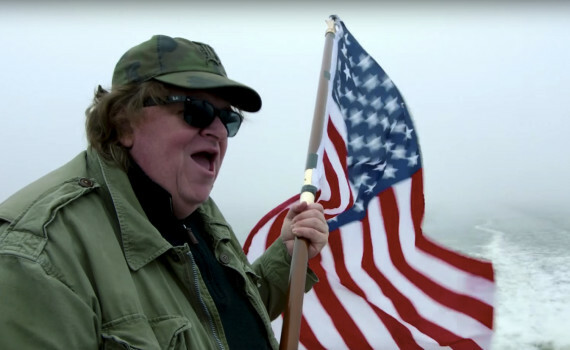 Bowling for Columbine, Fahrenheit 9/11, Sicko, Capitalism: A Love Story, and now Where to Invade Next; if you’ve seen one Moore film you know what to expect from others, with varied content but consistent morals. But no matter which side of the aisle you stand on, his latest project is something we can all get behind, an exploration of what we as a country get right, what we get wrong, and what we may be able to do about it. In what on the surface might be assumed to be an anti-war movie, Moore instead takes a different path, exposing America’s faults in a completely unexpected way. Moore sets himself up as a one-man army, “invading” countries around the world who have achieved greatness in a specific area, “stealing” their ideas to bring back home. In Italy, long vacations and easy work weeks have led to a much higher life expectancy. In Slovenia, college is free and the education standard is one of the highest in the world. In Germany, the middle class in thriving and the average worker lives comfortably. These are but a few examples of the successes countries around the world have achieved, begging the question; why haven’t we? For the first time, this might be a Michael Moore documentary that we can all get behind. His others may have been too liberal for the majority of Americans to accept; limit guns, blame the President, give free health care, do away with competitive economy. But here we have something that we all can agree upon, based largely on the way it’s presented. America is pretty great, but we’re not perfect. Other countries aren’t perfect either, but here’s something they do that seems to be working. Let’s look at it to see if it could work here as well. Sound difficult? Moore succeeds in making his message easy to accept, that if a progressive prison system leads to low recidivism, isn’t that something we could try? If eliminating standardized testing creates the smartest country in the world, isn’t that an idea worth considering? Moore presents these ideas as smart options that work for others, despite those countries not being absolutely perfect and perhaps only recently adopting those ideas themselves. This documentary is full of “ah ha” moments, it flows swiftly, and is fairly bipartisan, making it one of Moore’s very best.